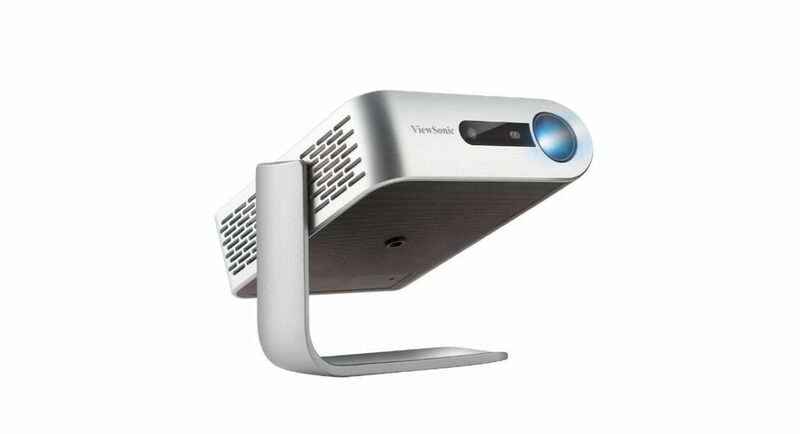 ViewSonic is out with its new M1 projector in India. The projector is designed to be compact and lightweight and weighs approximately one and half pounds, which makes it very portable. Whether you are carrying it from one room to the other or taking it with you when you go out somewhere, the company says that Viewsonic M1 can handle it all. The Viewsonic M1 projector features 250 ANSI lumen of brightness, and is engineered with a contrast ratio of 1,20,000:1. Also, there is a short-throw lens that is capable of displaying large images in small spaces. The projector comes with multiple connectivity options including an HDMI port, USB 2.0 and USB Type-C ports, Audio Out and a microSD card reader. The ViewSonic M1 projector is incorporated with the latest solid-state LED technology which makes it mercury and lamp free. Furthermore, it has support for Full HD (1080) resolution. The projector is compatible with optional PGD-350 3D glasses and comes with an integrated, patent pending Smart Stand that provides simple setup and allows the device to be placed in different positions at almost any angle. This also helps it to increase the lens cover by doubling it. Once you uncover the lens, the ViewSonic M1 projector gives brightness and makes it available for instant use. It is worth noticing that it has a built-in safety feature which temporarily turns off the lens when objects are very close to the projector. The M1 projector features Dual Harman Kardon speaker and is available at cost of Rs 49,000. Now let’s talk about the ViewSonic TD1630-3 LCD-10-point multi-touch monitor. This monitor is incorporated with advanced ergonomics, and the display is flexible enough to be adjusted for maximum comfort. The Monitor provides touchscreen versatility for retail or business settings. In terms of display, the monitor has a 16-inch (15.6” viewable) display with a 10-point multi-touch functionality. For connectivity, the ViewSonic TD1630-3 LCD-10-point monitor comes with VGA and HDMI inputs. The display is compatible with many operating systems including Windows 7/8/10, Linux Kernel 4.X/3.X . The touchscreen provides ultra-responsive touch experience that is suitable for interactivity in retail or business settings. The ViewSonic TR1630-3 monitor is priced at Rs 20,000.